The annual fundraising event run by the Club to provide funding for professional tuition for our Junior golfers will be held over Saturday 30th and Sun 31st March. The event is an 18 hole stableford competition with teams of four, gents, ladies or mixed and with two scores to count on each hole. Winner will be the best score on either day. Entry fee is €35 per person per day or if you would like to play on both days with same team or other , it's €50. The organising committee are trying to make an extra push this year with a great array of prizes on offer. First prize will be 4 electric trolleys complete with Lithium batteries. In order to make up as many teams as possible, and for the event to gain momentum,members are asked to put their names on the timesheet if you intend to play on either or both days. 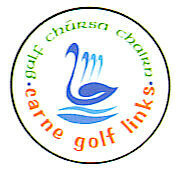 If you know anyone who would like to sponsor a tee or green on the day for a fee of €50 please contact the Hon Sec John Geraghty at 0862767418 or the Junior Convenor Peter Mulry at 0830466322. Presentation of prizes will be held on Sunday evening March 31st. 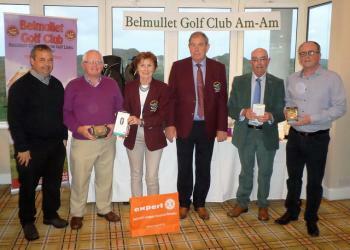 Pictured: Winners of the last Club AmAm were Seán O'Coisdealbha, Padraic Lynskey,Liam Power and Gary Todd.